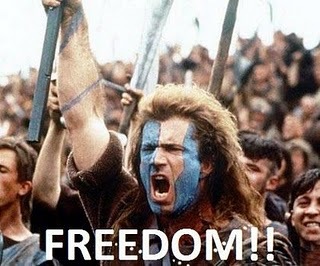 FREEDOM!!! This word was probably made most famous by Mel Gibson in his line from the movie Braveheart. But in America, every 4th of July, it takes on great meaning. Here in the United States of America, we have become accustomed to, expectant of, and proud of our freedom…and we rather enjoy it. But have you ever stopped to ask yourself “Why?” Why do we enjoy our freedom so much? Why does it bring so much joy? Or another way of asking it…why does slavery and oppression upset us so much? Suffering entered the world through man’s disobedience. When Adam and Eve chose to disobey and thus rebel against God, their fate was set and their slavery began. Genesis 3 records the tragic choices that led not only to their punishment but to all of mankind’s death and separation from God, and thus separation from the freedom that we were designed to have in perfect union with one another and the heavenly Creator. But Adam and Eve arre not alone. In John 8:34 Jesus says, “Everyone who commits sin is a slave to sin”. Therefore, because of Adam and Eve’s sin they became slaves to it; but all of us since then have chosen slavery as well (Rom. 3:23). And for that choice there is a consequence, that consequence being death and separation from God (Rom. 6:23). So if we were designed for freedom, but have become slaves to sin through our own choices, is there anyway to return to freedom? Can we become free once again? I heard it said once, “For freedom to become a reality the greatest sacrifice must come from the just”! And this is how freedom came for us as well, the just had to sacrifice. The only one who is ultimately just in all His doing is God. Psalm 146:7 states that it is God who “executes justice for the oppressed…the Lord sets the prisoners free”. Jesus reiterates the way to freedom in John 8:32 stating, “The truth will set you free”. So what truth is it that can set us free from slavery to and oppression from our own sin? It is the Just who sacrificed Himself for us so that we might regain the freedom for which we were created and designed. Philippians 2:6-8 references this regarding Jesus Christ, God in flesh, “Who, though he was in the form of God, did not count equality with God a thing to be grasped, but made himself nothing, taking the form of a servant, being born in the likeness of men. And being found in human form he humbled (sacrificed) himself by becoming obedient to the point of death even death on the cross”. This is how we can regain the freedom lost in our slavery to sin. It is by Christ and Christ alone, through His sacrificial blood and death that we can be saved and set free from the wages of sin. It is only because, “He became sin who knew no sin, so that we might become the righteousness of God”, that anyone can be set free from their sin. So how does we become free once again? Simply by recognizing our enslaved condition to sin in which we have no power or authority to overcome by ourselves. We must believe that Jesus Christ is the only Savior. As Romans 10:9 says, “If you confess with your mouth that Jesus is Lord and believe in your heart that God raised him from the dead, you will be saved”. It comes down to recognizing two truths: who we are as slaves to sin and who Jesus is as Lord and Savior of the world. So do you need to return to freedom? Are you still a slave to sin? While we celebrate this 4th of July and our freedom as citizens of the United States of America, don’t forget: the Just made the greatest sacrifice for you–not to give you freedom in America, but to give you freedom from your sin!